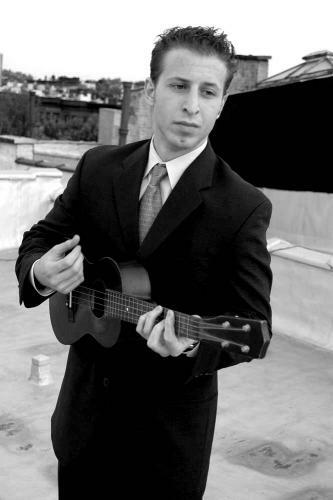 "Jeff performs his songs on the piano and this 4-stringed acoustic/electric baritone ukulele. Jeff's ukulele uses an unconventional tuning similar to the alternate "G" tuning for the tenor ukulele: the strings are tuned D-G-B-E like the bottom strings of the guitar, except the D is raised an octave. Why the strange tuning? When Jeff got the uke as a gift, it came tuned that way. He taught himself to play it like that, unaware that it was strange, and with no ukulele experts at hand to alert him to the abnormality. So that's how it'll always be, tuned strange." Jeff is a co-founder of the award-winning comedy group Elephant Larry and reportedly can play the uke and sax simultaneously.